Prior to the match, Lucha Libre Boom (Fantasma de la Opera, Carta Brava, Suicida among them) ran in to challenge the Memes wrestlers. Bloody match. Video off the top matches are already. Heard the title match was really good, and that Cavernario looked injured during this match, though I’m unclear if it was something he came in with or suffered during along the way. Good turnout for the show. 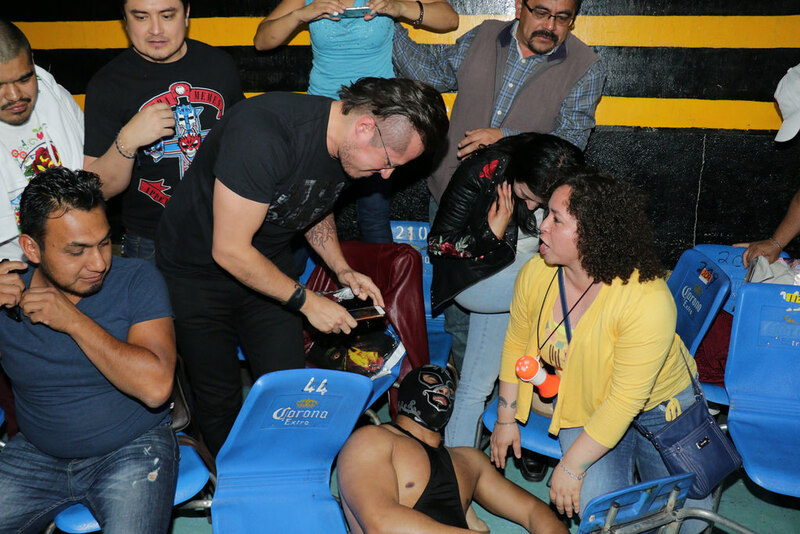 A Lucha Libre Boom invasion has no interest to me – Fantasma de la Opera & (this) Carta Brava do not have interesting matches, and guys like Arez & Suicida work for both – but it’s not for me. Matches 4 & 5 sounded like they went very well. Beyond the singles match, they’re teasing Atlantis vs Ultimo Guerrero in an apuesta too, which seems like an odd decision if they’re actually going to be delivering Angel de Oro vs Cuatrero. Tonight’s Arena Mexico has that exact match, Angel de Oro versus Cuatrero, in what’s increasingly looking like the Homenaje a Dos Leyendas main event. CMLL may make that official as soon as tomorrow’s noon press conference. Today’s match is more about seeing if they can make it a little bit better than their match in Tokyo. The actual main event is Caristico, Niebla Roja and Valiente versus Los Hijos del Infierno, who have been put together as a unit a little more often lately. The fourth match pits y Cometa, Soberano and Titan against Rey Bucanero, Felino and Hechicero. Audaz & Kawato are in action tonight. It’s the same rudo trio as Friday (Kawato, Virus and Misterioso) against Audaz, Fuego and Guerrero Maya. The show begins at 7:30 and will air on CMLL’s YouTube channel. Guadalajara has Marco Corleone, Volador Jr. & Dragon Lee versus the Guerreros and an odd Blue Panther vs Okumura singles match. Puma returns from Japan to CMLL on this show. A couple of days ago, PlanetaWrestling said there were plans for a WWE Latin American tournament. Dave Meltzer confirmed that Latin American tournament on his podcast (and also on his message board.) Both say the tournament would take place in August. After Meltzer amplified the story, WWE’s William Regal said no Latin American tournament is scheduled at this time. Regal’s denial is a pretty hard denial but Meltzer is usually not that far wrong. It could be the story got out before it was official or ready to be announced “at this time”, or it could be just not happening at all. I had a lot written here about that tournament, and I can rewrite it later when if it’s official later. The short version is I would expect people from CMLL and Mexican indie people to be plucked for any such tournament. It looks like AAA is going to promote the Johnny Mundo & Hernandez vs Dr. Wagner Jr. & Psycho Clown main event for Aguascalientes, even though La Parka seemed to earn a title match for this show and Taya sure was clear on Mundo being done after Guerra de Titanes. Mundo did show up for that show and they did address his situation before the show last time, so perhaps they’ll do it again here. AAA’s Twitch channel is not exactly what I thought it would be the first few days in. It looks like they’re going thru the 2011 calendar year of TV tapings, and airing 5-6 episodes (or around 8 hours) a day on a loop. It’s not perfectly going in order – there was a bunch of AAA April 2011 shows that seemed to be skipped yesterday – and it’s not going as far as you’d eventually hope, but it is decent video wallpaper. I know they’re probably going to add more over time, and the one thing I’d like to see now is just a listing of what episodes are streaming that day to give an idea of what matches to see. Today’s batch includes a Naucalpan show I recall as being good. Hijo del Santo, as he does every year, held a press conference at El Santo’s statue to remember his father’s passing. He mentioned the TV series (which I mistakenly called a movie) will begin filming in August & September with the idea of it starting to air in December. Hijo del Santo says he’s going to only wrestle sporadically to concentrate on the show, though that seems to be his normal amount of wrestling now anyway. Here is footage of El Santo on the subway. Rebelion Amarilla will be on The Crash show in Tijuana. Bestia, Garza, MechaWolf, Black Taurus and Lacey Lane are pictured. Daga has also been announced. The Crash also announced classes for it’s new training center. I’m on the latest edition of the Winter Palace. Villano III Jr. and Rey Wagner said pleasant things about wrestling in Mazatlan. My current theory is Lucha Azteca is getting strange matches because they’re now splitting the matches between two different TV shows. They were definitely recording introductions for the (ClaroSports TV) Titanes en el Ring show a few weeks back, so it may be them or Teleformula. 3) Niebla Roja, Soberano Jr., Titán vs Forastero, Sansón, Universo 2000 Jr.